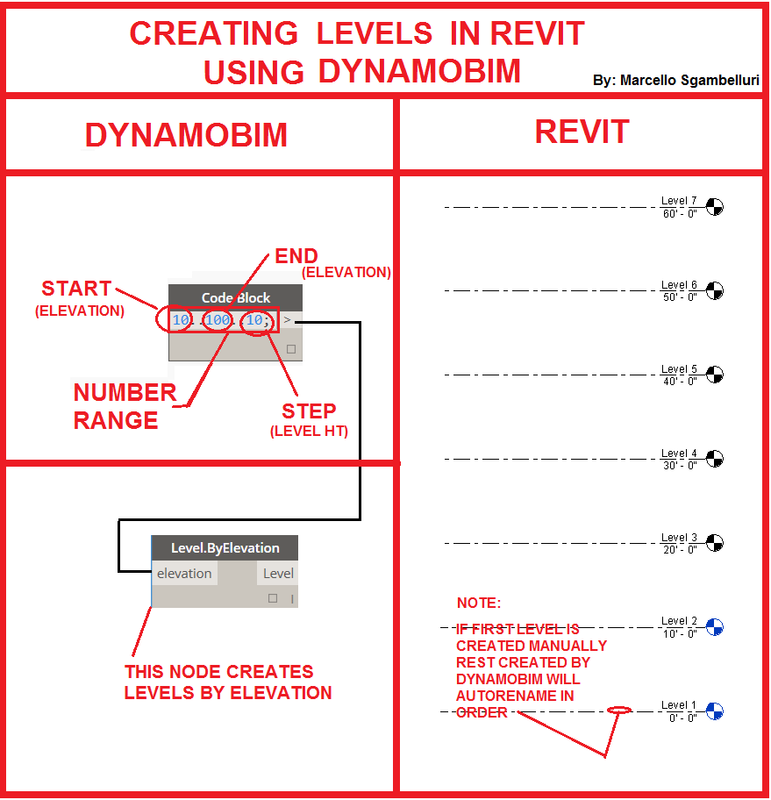 Its easy to create levels in Revit using DynamoBIM. If you use design script then it only takes two nodes. The image below summarizes this process. The key is to use range values that I discussed in a previous post here and then multiple levels will be generated. This example only shows levels that are assigned a level name. There are other nodes that create Levels however this is the simplest. Note that if you create the first level manually and name it "say level 1", when DynamoBIM is ran for the first time it will name the levels in order. Its very similar to creating Grids as shown in this post. I hope this helps and good luck creating Levels. Thank you very much for posting all the useful tutorials. I created levels with a little bit more complex Dynamo definition than this method. The problem I have is that all the levels would disappear after the Dynamo is closed. Am I missing the fundamental thing in Dynamo? Is there a Dynamo node like "bake" in Rhino to separate elements from the Dynamo definition? How can I keep levels (or other elements) created from Dynamo in Revit? I've just found out that I closed only the specific definition while keeping Dynamo opened. I had to close Dynamo itself. Thank you. Thanks for these examples. Very helpful. I was trying to create levels in Dynamo so they would be place above the highest existing level in Revit. I was using the 'Element.GetParameterValueByName' to get elevations from Revit and then filtering and sorting them into a list to the the starting height. I've hit a road block (or code block). What I would like to be able to do is instead of specifying (start..end..spacing) I would like to specify (start..number of new elevations..spacing). Any ideas? Thank you.